After two knock-down, drag-out debates, Americans certainly weren’t expecting Hillary Clinton and Donald Trump to be models of decorum in the final one. That’s why it was so heartening when moderator Chris Wallace injected some much-needed civility back into presidential politics by pressing a loaded gun to his head and threatening to use it if the candidates ever interrupt each other. 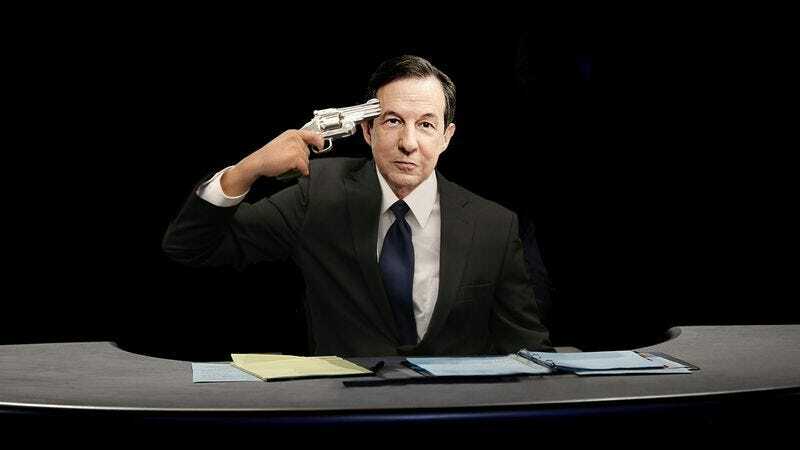 Um, can we please have Chris Wallace moderate every debate? Election MVP, anyone? As soon as the candidates walked onstage, Wallace took command of the debate simply by loading a .357 Magnum revolver with a single cartridge and placing it firmly against his temple. Before asking the first question, he sternly warned the candidates that at the first interruption by either of them, he would “paint the audience with Wallace.” From that point on, the gun hasn’t left his head, nor has his finger left the trigger. Finally, we can have a debate on the issues! And it’s all thanks to Chris Wallace’s steadfast promise to keep the carbon steel barrel glued to his right temple for the entire 90 minutes, not even switching arms when he gets tired. For the most part, his strategy seems to be paying off. The candidates have maintained a more courteous back-and-forth than in past debates for fear of Wallace blowing the top of his skull off. While there’s been no shortage of jabs, digs, and mud-flinging, both Trump and Clinton have been keeping to their time and remained silent while the other speaks, instead staring intently at the beads of sweat collecting on the barrel of the gun. And when at one point Trump cleared his throat as if to cut Clinton off, all it took was Wallace cocking the hammer to keep him quiet. Take note, media: This is what it looks like when the moderators do their jobs! We’ve still got a lot of debate left, and it remains to be seen whether the rest of the evening stays as respectful as it’s been so far. Trump’s notoriously short attention span may still land him and Wallace in hot water, a major stumble on the national stage that the Republican nominee definitely can’t afford. Here’s hoping Wallace manages to get the candidates to keep it clean, and that this ugly campaign ends on a civil note!